These are the Scruffs Switchback safety boots and I purchased them in August 2015 for about £45. They’re not bad boots at all and I found them more comfortable than a previous pair of Scruffs boots. 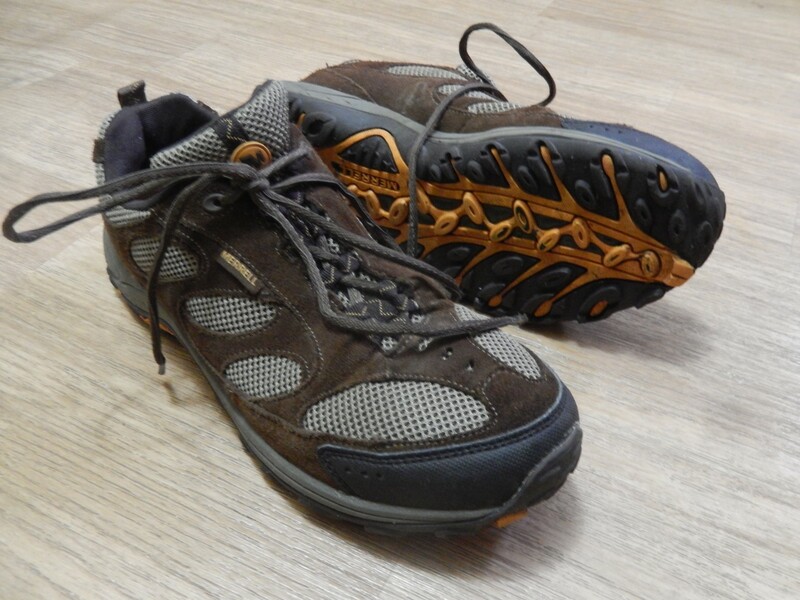 Quite light in weight and in the hiker-style (which obviously appealed to me). 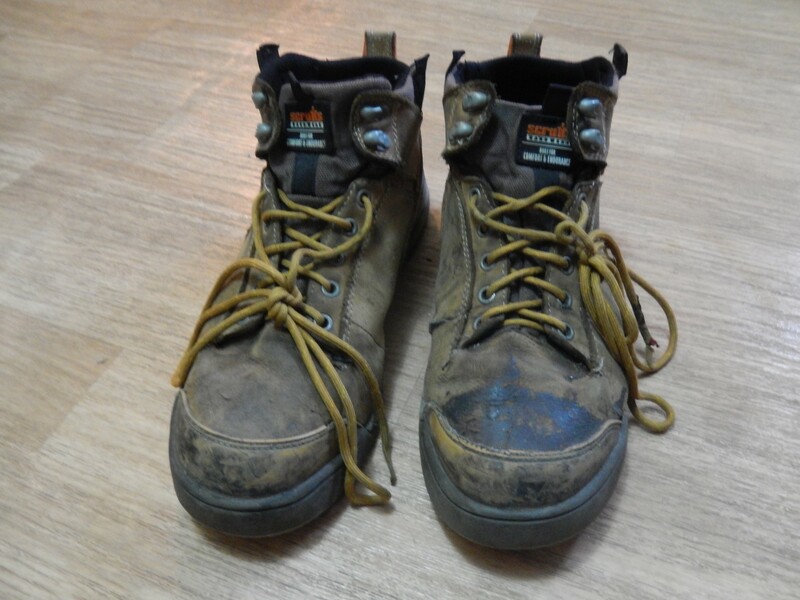 My work boots rarely last as much as two-years through daily wear. These haven’t been too badly bruised, aside from the spillage of contact adhesive. You can see that I quite recently replaced the laces, which barely lasted twelve months. Aside from the fact that the stitching has failed on one foot (and this happened several months ago), I’ve decided that I don’t need the extra ankle support in my current role (workshop based with minimal heavy lifting) and it was only while shopping around that I realised you can now buy boots with a toe cap made from a composite material where it has traditionally mostly been steel. Steel is, of course, a metal and, during cold weather, it will conduct a cold temperature. In a warmer climate, I believe it will attract moisture and warm air to settle which, coupled with a lack of breatheability in a boot’s design, is what I believe contributes towards a feeling of damp toes in each sock (not pleasant, especially in the cold months). 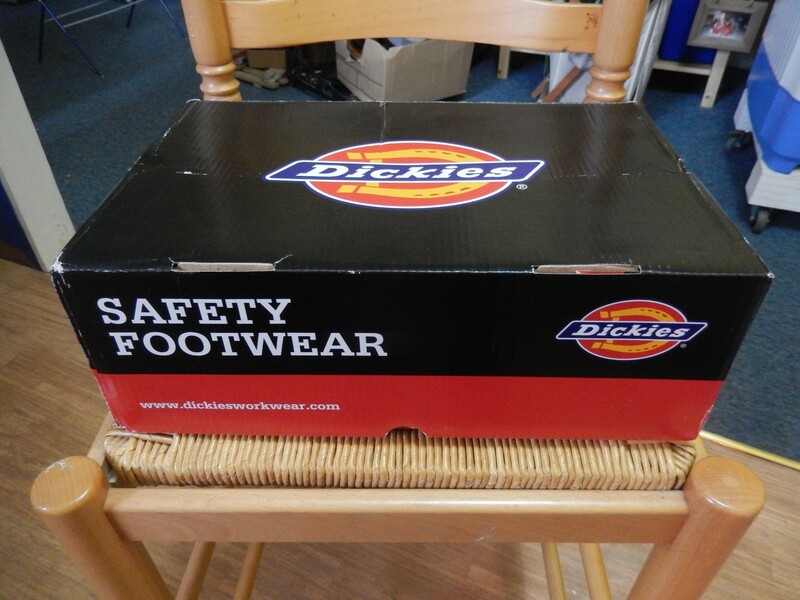 I’ve chosen the Dickies Tiber safety trainers, based on a selection of mostly positive reviews. They’re expensive if purchased direct from Dickies but shop around online and you’ll find them available for £20 less, as I did. 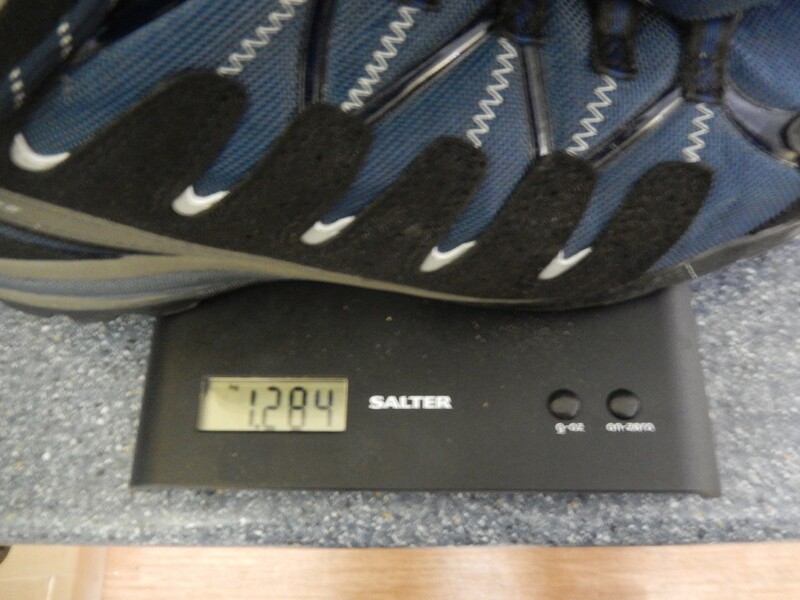 I’ve learnt over the past two years that my most comfortable shoe size is, generally speaking, a UK 10½. 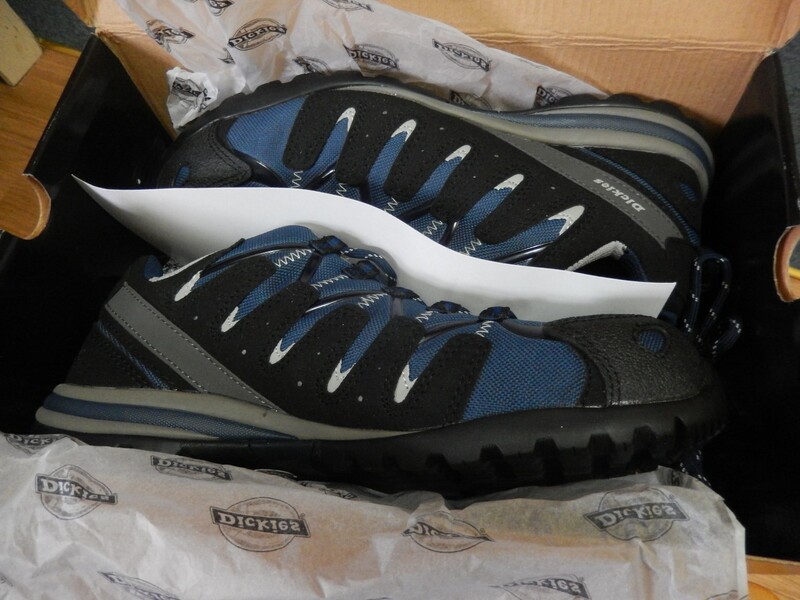 Quite often though, I can buy a pair of shoes (excluding hiking boots) at a UK Size 10 and they will be fine… I tried to do just that with these Dickies Tiber boots and found them to be uncomfortable. Fine for the slightly narrow shape of my feet but my big toe was just touching the end. If it’s touching now, it could be hurting later, as our feet tend to expand, shrink and move throughout the day. Interestingly though, my Scruffs boots have always been a UK 10 and left me with sufficient room for comfort. I’ve found it very difficult to find a UK Size 10.5 (with a non-steel toe cap) and yet, these trainers are also available in 11.5 UK. So, I ended up buying a UK Size 11 instead. I’ve yet to return the Size 10s because the seller I bought them from is reluctant to provide me with a free returns label, even though their website states that they do offer it… I may look instead to make a quick sale locally online. As long as I don’t lose any more than the parcel would cost. Immediately, I found the UK 11 sizing to be a bit long for my feet. Also, even with a higher volume insole in place (which I’ll get to shortly), I’m concerned about the fact that the material is almost ‘folding’ above the bend in my toes. I believe this is currently because my shoes are oversized and this was not an issue with the tight 10s. 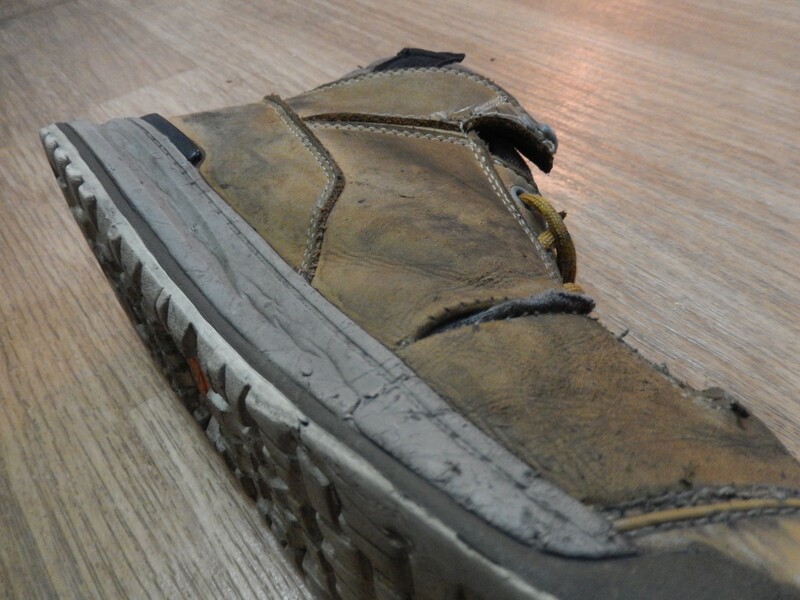 An additional pair of thin volume reducers fitted beneath the insole may help. 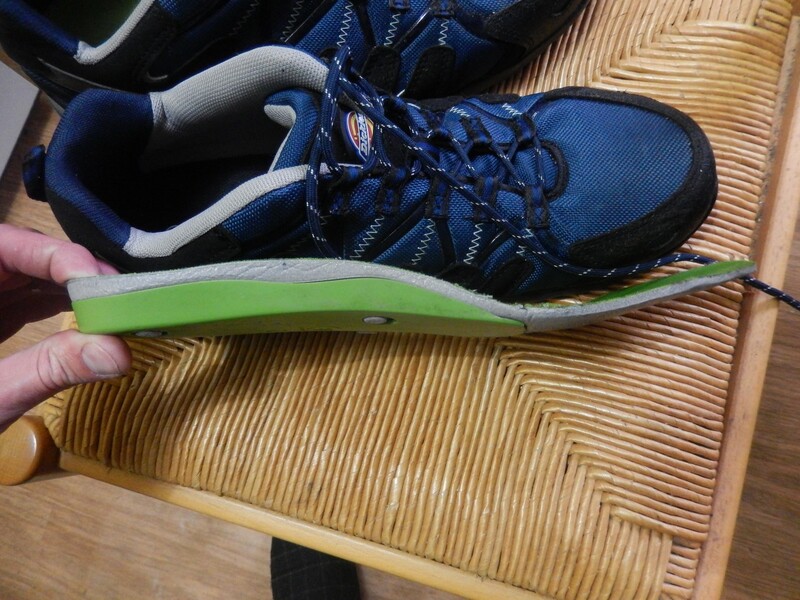 Of the negative reviews and comments I have read, many people are critical of the ‘hard, flat’ insole. It’s a long way from orthotic, which is why I’m using a pair of Superfeet branded insoles (these are the ‘Green’ ones) that were also in my previous boots. 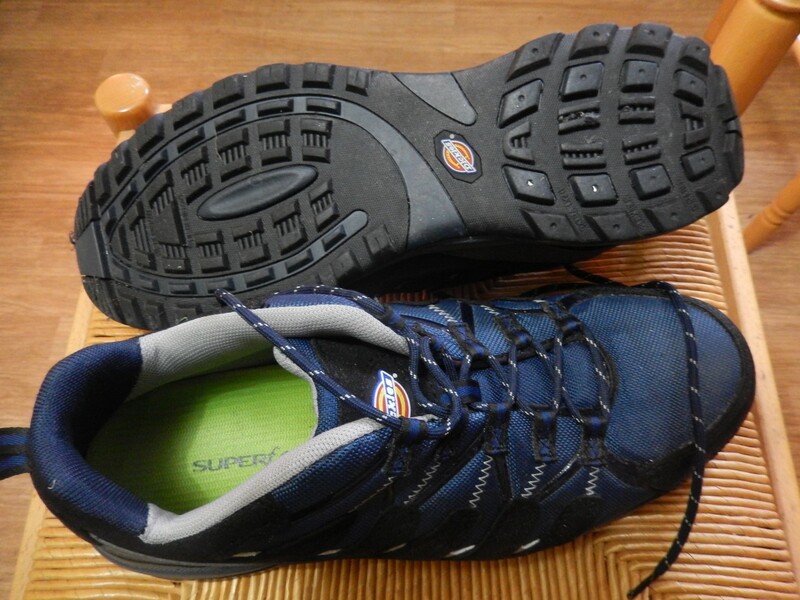 Superfeet insoles do not appear cheap but I do believe they are worth the investment. I’ve been buying cheap (£10-15) insoles for years and have burnt through the heel on several in less than six months. As someone said to me recently; if you don’t look after your feet, you’ll soon feel it in the rest of your body and replacements don’t come cheap or easy. Another critical comment was on the lack of waterproofing in these safety trainers. Well, that doesn’t concern me as I work indoors. 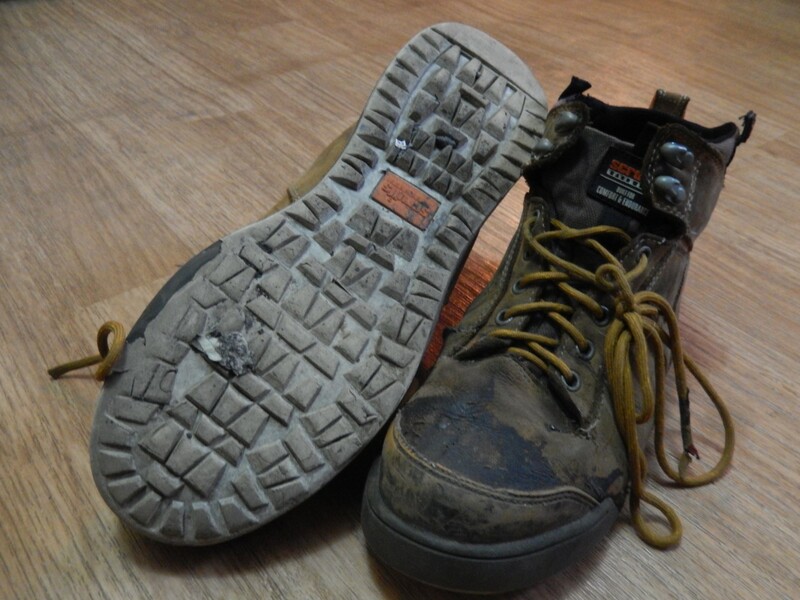 If you’re exposed to the elements in your work, you may prefer to look for a leather or gore-tex boot – and to look after them; cleaning and re-proofing regularly. I’ve only worn them for the first time today and I’m not convinced that they’re nearly as good as the £160 hiking boots I purchased last week (you do get what you pay for). Time will tell. I noticed a slight damp sensation left on the toe end of the Green insoles but my socks weren’t soaked. 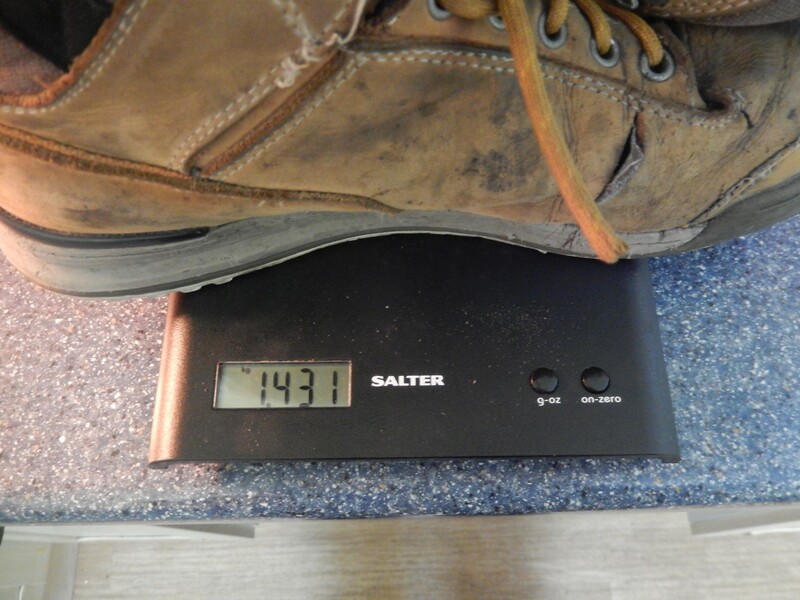 Starting with my previous Scruffs boots (which will soon be landing in to a local recycling bin), you can see they weigh in at 1.431kg in a UK Size 10. This is regarded as being ‘lightweight’ and is almost on a par with my Salomon hiking boots. This was with the original Scruffs insoles fitted. My new safety trainers are a good 150g lighter, which can only be a good thing for my daily comfort. I took this reading with the Superfeet Green insoles in place. I’m not displeased with the purchase and no-one has yet to comment on my chosen colour (they’re also available in red, black and another mix of blue). Spare laces are included (which I don’t often find) although, I can’t imagine these will wear as quickly as the others. Breatheability, I feel, is the only issue that may cause future concern. I expect these to last the usual two years, unless I happen to change jobs and move in to a different environment. It would be easy to knock any brand of safety boot for a lack of comfort in the footbed and insole department but that’s why there are companies who work hard to produce aftermarket options. For those who may be interested: my day-to-day shoes are actually made by Merrell. 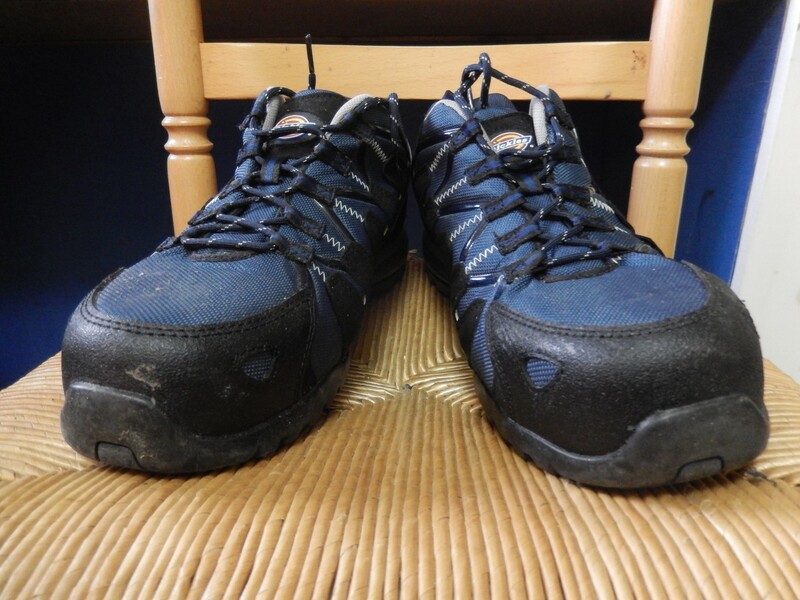 They’re classed as lightweight walking shoes and only cost me £30 last year. I wouldn’t wear them up a mountain but, even without an added insole, they’re above the Karrimors I used to wear and ideal for brief evening walks.